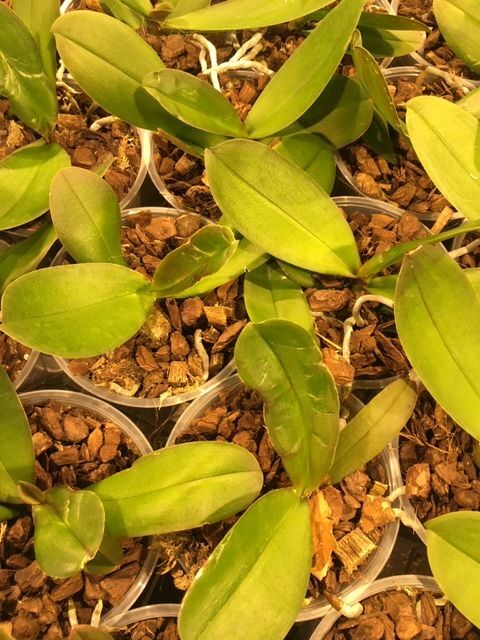 Thrips can occur in the cultivation of Anthurium and Phalaenopsis. This card shows the characteristics of a number of thrips and the possible damage symptoms associated with them, supported by pictures. This card is not exhaustive: information can also be obtained on the internet and from suppliers of chemical and biological anti-thrips agents. The following thrips can be found in both Anthurium and Phalaenopsis cultivations. These thrips are yellow to light brown in colour, 0.8-1.3 mm long and 0.15 mm wide. The eyes are relatively large and have a reddish purple colour. The colour of the wings is alternately light and dark brown. The larvae are often found in clusters on the leaf. Pupation: in the ground or substrate. Adult: lives 1-3 months. The thrips prefer the young parts of the crop. They often hide in the leaves that are still rolled up or prick the newly growing parts of the plant. Visible damage is often already 6-8 weeks old. Affected flowers and bracts are deformed and often unmarketable. There are white streaks, stripes and scars on the plant. When strongly infested, flowers and leaves no longer grow out. 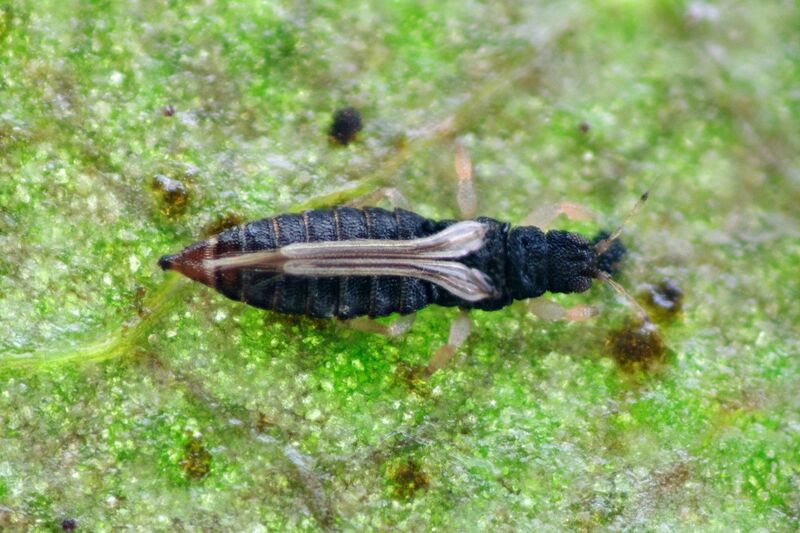 The thrips are small, black and therefore limited in their movement. The damage symptoms of these thrips are therefore usually very local. The damage is especially visible in the flowers of the orchid. These thrips vary in colour: in summer they are lighter than in winter. The adults have two pairs of wings and measure 1.3-1.4 mm. The larva is yellow to orange and has no wings. Adult: lives from one to several weeks. Leaf: grey/glazed spots where the leaves are affected. Flower: distorted or desiccated flowers. These thrips are also known to transmit viruses. The females are 1.6 mm long and the males are 1.3 mm long. They are dark brown to black in colour and slightly armoured. The head and neck have a segmented structure. It is striking that the ends of the legs are yellow and the dark wings are light at the 'shoulders'. The pupae (yellow and white in colour) can be found on the crop. This is in contrast to other types of thrips, where the pupae can be found in the substrate. Both larvae and adults cause suction damage: this appears as yellow, white or silver spots and deformed growth points. This deformation causes irregular leaf edges on Anthurium, for example. These thrips cause miner-like damage on the leaves and are also known as leaf thrips. Echinothrips americanus causes no damage to the flowers. The adult thrips are 1-1.5 mm in size. The larvae are transparent or white/yellow. In practice it is almost impossible to distinguish Thrips Setosus from Echinothrips. 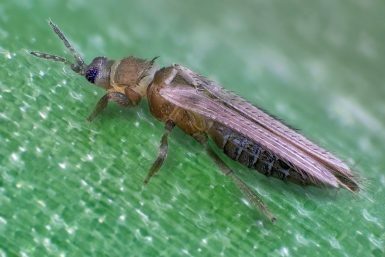 It cannot therefore be ruled out that in some cases an infestation of Thrips setosus may be confused with Echinothrips. In this case, an examination by specialists can provide a decisive answer. 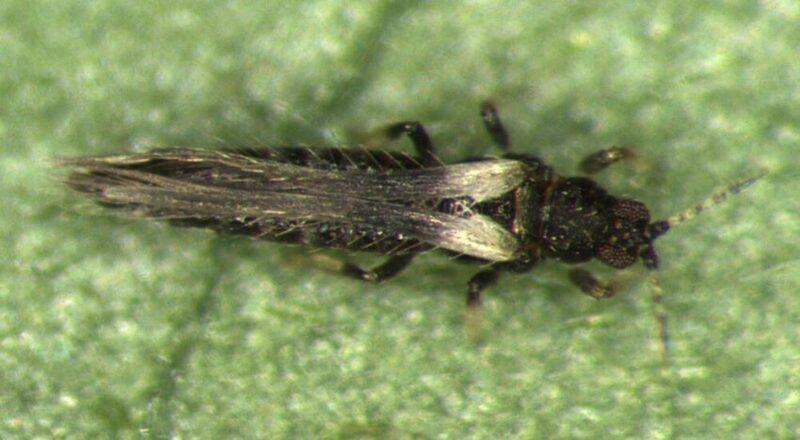 This thrips causes more flower damage than Echinothrips. The colour of this adult depends on its diet. It is usually light brown to light yellow with grey/brown wings. The antennae of these thrips are short. It has a length of 0.8-1.2 mm and two pairs of wings with fringes. These thrips feel at home in leaf veins. 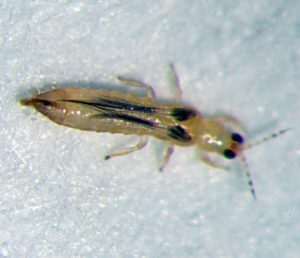 The thrips are very active and crawl away when their environment is disturbed. Eggs: in the leaf and leaf stalk. 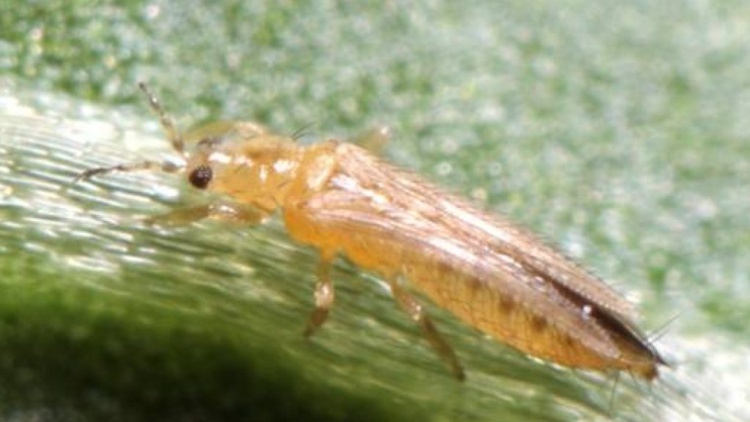 These thrips cause damage by pricking the leaves and sucking cells from them. The tissue around this cell then dies off. Silver-grey spots appear on the leaves and, if severely affected, growth will be inhibited or stop completely. 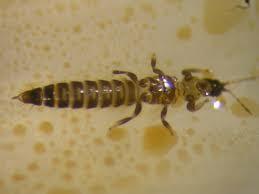 The adult greenhouse thrips is 1.2-1.8 mm long and has a dark brown to black body with an orange dot on its abdomen. Furthermore it has white legs and narrow wings and its antennae are light yellow. Characteristics of infestationThe yellow-brown larva secretes red drops on which fungi can develop. 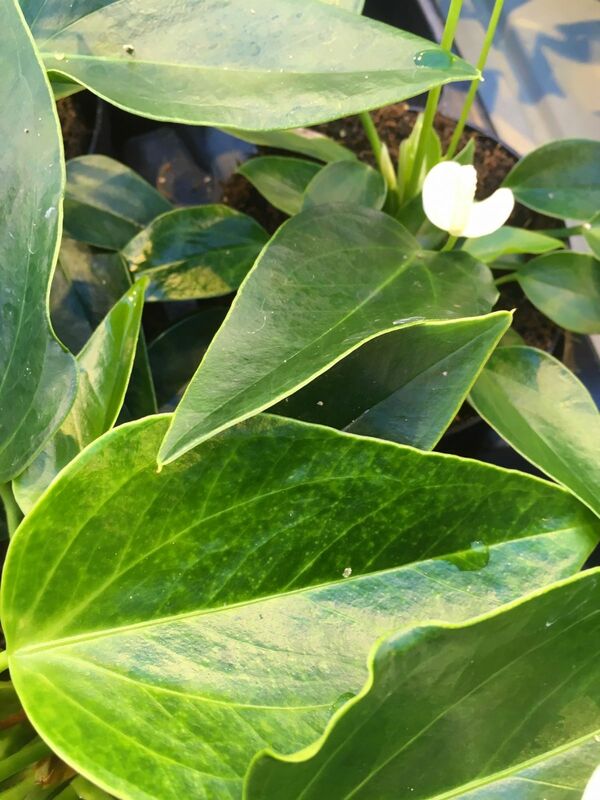 The suction damage causes silvery, white spots on leaves and flowers..
Naast deze thripsen komen ook de volgende thripssoorten voor in de anthurium- en met name de phalaenopsisteelt.